We're professed admirers of the slightly bonkers penthouse at 140 Perry Street, which wowed us with its industrial vibe and mysteriously climbing square-footage after hitting the market back in November for $19.5 million. This week, New York magazine drops another of its quarterly Vu. 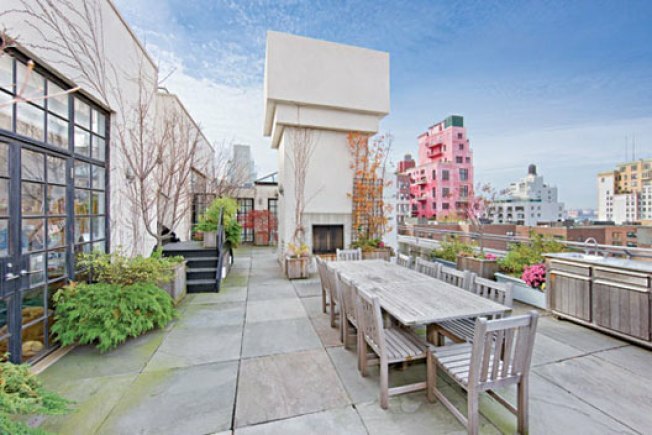 real estate supplements—though with less cheer and fanfare this time around—and they check in on the West Village stunner, a duplex with roof deck perfect for spying on Palazzo Chupi. Five months later, the apartment is still on the market at $19.5 million. According to Elliman broker Jan Hashey, offers have come in around $12 million, but the owners "don't need necessarily to sell," so they're holding firm -- for now. Other Vu. highlights include a tour of houses put up for sale by Madoff victims, and a look at recent winners and losers in the art of flipping.